Sandhill cranes range over much of North America, with smaller populations extending west to Sibera. The cranes migrate to summer breeding grounds in Alaska, Canada and the northern United States and return south to Mexico, Florida and other places with warm climates each winter. 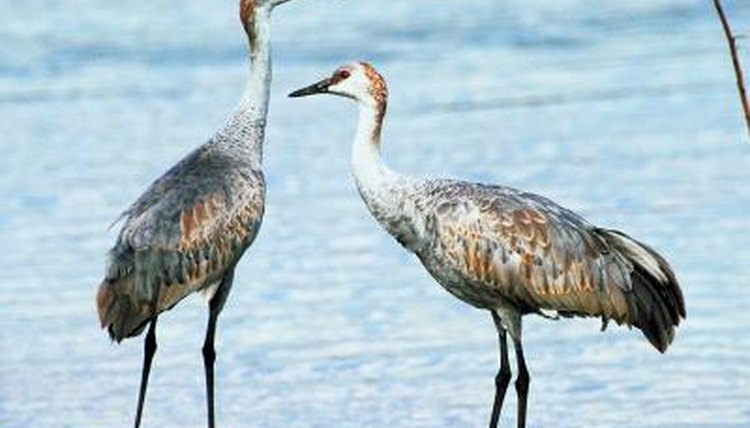 Little differentiates gender in sandhill cranes. Careful observation can provide valuable clues. Sandhill crane males are slightly larger than females, weighing up to 14 pounds. Females remain closer to 10 pounds. The birds grow up to 5 feet in height measured from toe to the top of the head when they are standing on the ground. The male is generally a couple inches taller than the female. Cranes mate for life. They perform a ritualized dance not only during breeding season but year-round. The male begins the dance, which a female will take up. Both cranes bow, leap, flap their wings and toss grass or other items in the air with their beaks. The males will throw their heads backwards onto their bodies while females will toss theirs back at 45-degree angles. Female vocalizations are generally higher in pitch by males' calls.